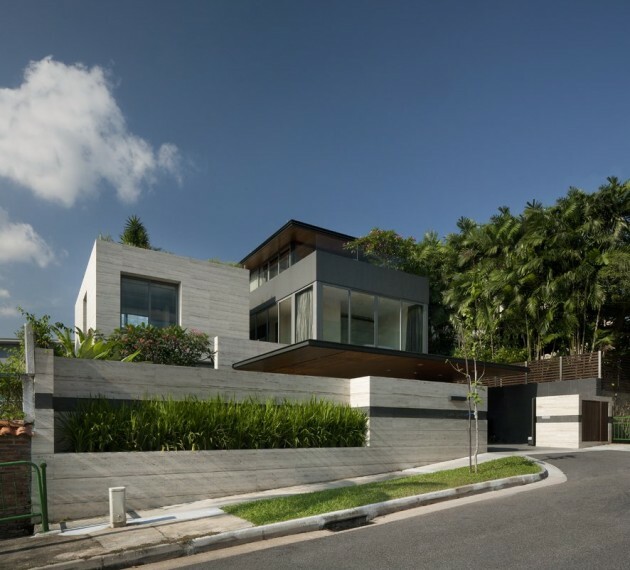 Wallflower Architecture + Design have sent us a house project called “Travertine Dream House” they have completed in Serangoon, Singapore. 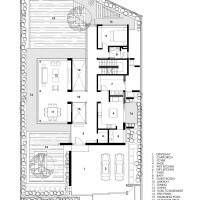 The client’s brief for this house was simple. 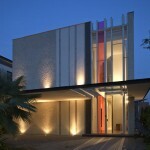 Functionally, to maximize usable area and to incorporate greenery. 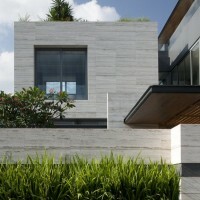 Aesthetically, to use travertine copiously as an architectural finish. 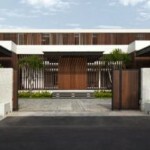 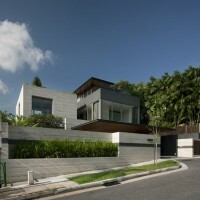 Inspired by the Italian urban-scape during his travels, so too would travertine express this house. 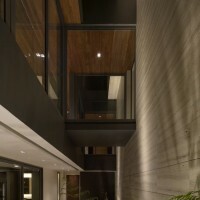 The house is organised as two parallel blocks connected by a glass enclosed bridge. 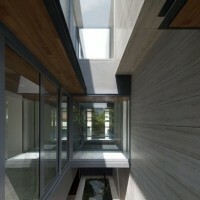 The separation between the two blocks allows daylight to stream down to basement spaces. 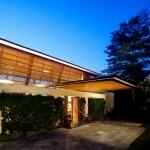 Thick travertine walls and large overhangs are placed on the western side to limit heat gain from the harsh afternoon sun. 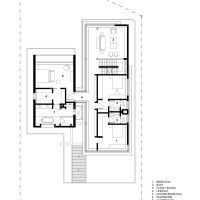 The entry, living spaces and bedrooms are arranged longitudinally to take advantage of natural cross ventilation and daylight. 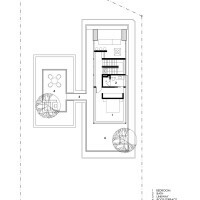 In order to intensify land use without ending up with an imposing structure, the four storied house has one level sunk into the ground and the other three set away from the access road. 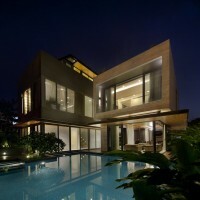 To accommodate as much green and ‘blue’ space as possible, the gardens and water bodies are spread throughout the house. 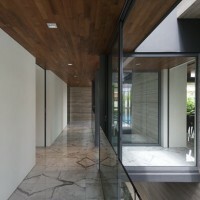 The living and dining areas on the ground floor face a swimming pool and a fish pond. 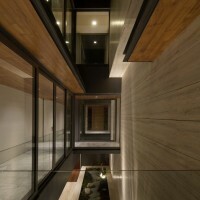 The basement’s entertainment and guest rooms are open to the sky, with natural light and ventilation coming through a sunken moss garden courtyard. 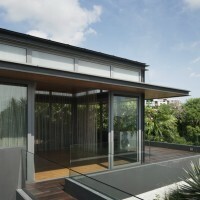 The third storey flat roof is both a recreational deck and a roof garden. 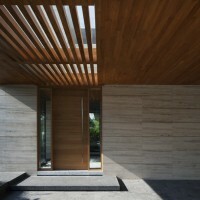 The arrival experience is orchestrated by several layers of travertine wall that suggest a tenuous threshold between the outside and the inside. 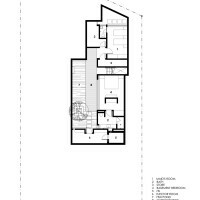 The detailing is deliberately minimal and precise to enhance the simplicity of the massing and the juxtaposition of solidity and transparency. 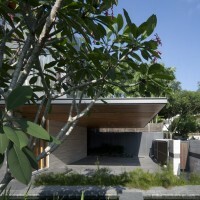 The narrow blocks that house the living area, the thick stone cladding, multiple levels of gardens and water bodies ensure that the house remains cool in the tropical environment, well ventilated and washed in soft daylight. 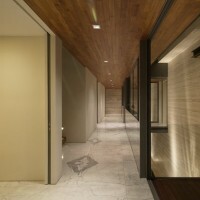 The three dimensional composition of voids, layers and solids creates spaces for both quiet reflection and family interaction, something for each mood and moment.